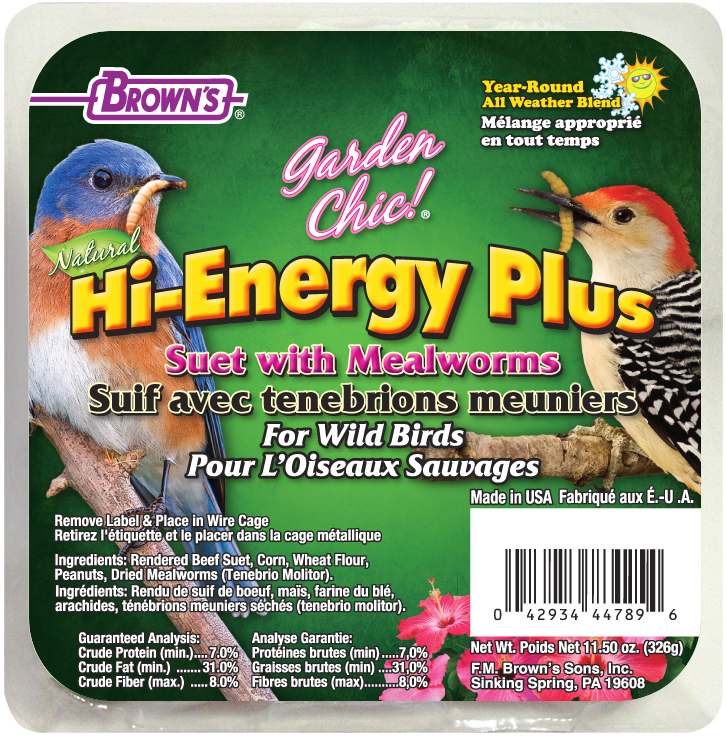 Brown’s® Garden Chic!® Hi-Energy Plus™ Mealworms Suet Cakes are made with pure, fresh suet blended with peanuts and real dried mealworms, making them ideal for year-round feeding. 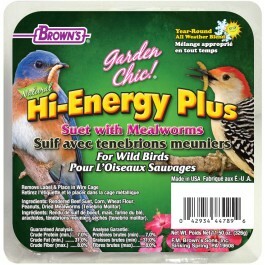 Brown’s® Garden Chic!® Hi-Energy Plus™ Suet with Mealworms is made with pure, fresh suet blended with peanuts and real dried mealworms, making it ideal for year-round feeding. Mealworms suet cakes fit into our easy-to-use wire feeding baskets to provide the fat and energy insect-eating birds need to survive the hard winter months and nest in the spring. • Fits Wire Feeding Baskets! • With Real Mealworms Insect-Eating Birds Crave! Rendered Beef Suet, Corn Flour, Peanuts, and Freeze Dried Mealworms (Tenebrio molitor).